Serenity BDD (previously known as Thucydides) is an open source reporting library that helps you write better structured, more maintainable automated acceptance criteria, and also produces rich meaningful test reports (or "living documentation") that not only report on the test results, but also what features have been tested. In this article, we will continue our exploration of Serenity, and see how it works with the popular BDD tool Cucumber-JVM. In the previous article we looked at how you could use Serenity BDD with JUnit to write clean, readable automated acceptance tests, and how Serenity also helps you write WebDriver-based automated web tests that are easier to understand and to maintain. We will be using the same domain example in this article as we did in the previous one, but we will be going over the basics again, so you can jump straight into this article even if you haven’t read the previous one. Behaviour Driven Development, which is a core concept underlying many of Serenity’s features. A team using Behaviour Driven Development use conversations and collaboration around concrete examples to build up a shared understanding of the features they are supposed to build. Conversations about concrete examples, and counter-examples, are a great way to flush out any hidden assumptions or misunderstandings about what a feature needs to do. "So give me an example of how a search might work." "Well, if I search for wool, then I should see only woolen products." "Sound’s simple enough. Are there any other variations on the search feature that would produce different outcomes?" 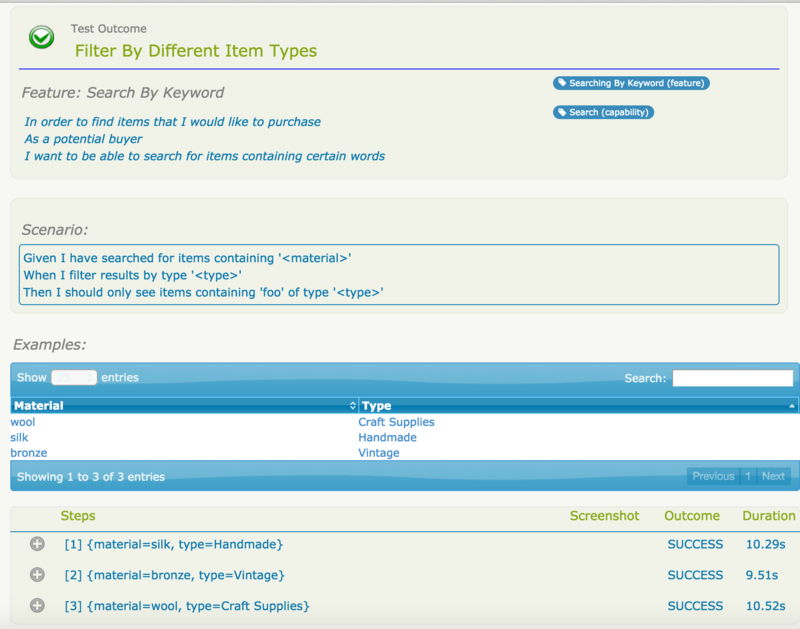 "Well, I could also filter the search results; for example, I could look for only handmade woolen products." "So you can filter by handmade items. Could you give me some examples of other product types you would want to filter by?" And so on. In practice, many of the examples that get discussed become "acceptance criteria" for the features. And many of these acceptance criteria become automated acceptance tests. Automating acceptence tests provides valuable feedback to the whole team, as these tests, unlike unit and integrationt tests, are typically expressed in business terms, and can be easily understood by non-developers. And, as we will see later on in this article, the reports that are produced when these tests are executed give a clear picture of the state of the application. This format is known as Gherkin, and is widely used in Cucumber and other Cucumber-based BDD tools such as SpecFlow (for .NET) and Behave (for Python). Gherkin is a flexible, highly readable format that can be written collaboratively with product owners to ensure that everyone . The loosely-structured Given-When-Then format helps people focus on what they are trying to achieve, and how they will know when they get it. In this article, we will learn how to automated these scenarios using Cucumber and Serenity BDD. Don’t worry if you haven’t used Cucumber before, as we will go through enough examples for you to see how it works even if you are new to BDD test automation tools. These feature files can be placed in different locations, but you can reduce the amount of configuration you need to do with Serenity if you put them in the src/test/resources/features directory. These step definitions use Serenity to organize the step definition code into more reusable components. The @Stepsannotation tells Serenity that this variable is a Step Library. In Serenity, we use Step Libraries to add a layer of abstraction between the "what" and the "how" of our acceptance tests. The Cucumber step definitions describe "what" the acceptance test is doing, in fairly implementation-neutral, business-friendly terms. 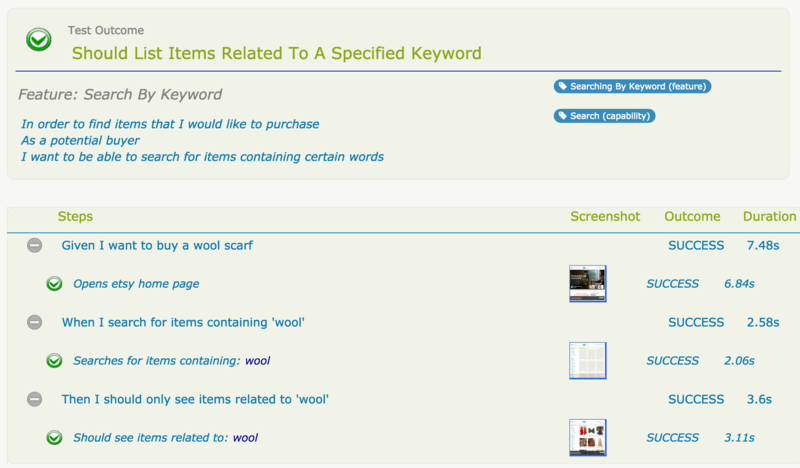 So we say "searches for items containing 'wool", not "enters 'wool' into the search field and clicks on the search button". This layered approach makes the tests both easier to understand and to maintain, and helps build up a great library of reusable business-level steps that we can use in other tests. Without this kind of layered approach, step definitions tend to become very technical very quickly, which limits reuse and makes them harder to understand and maintain. These step definitions implement the "what" behind the "how" of the Given-When-Then" steps. However, like any well-written code, step definitions should not be overly complex, and should focus on working at a single level of abstraction. Step definitions typically orchestrate calls to more technical layers such as web services, databases, or WebDriver page objects. 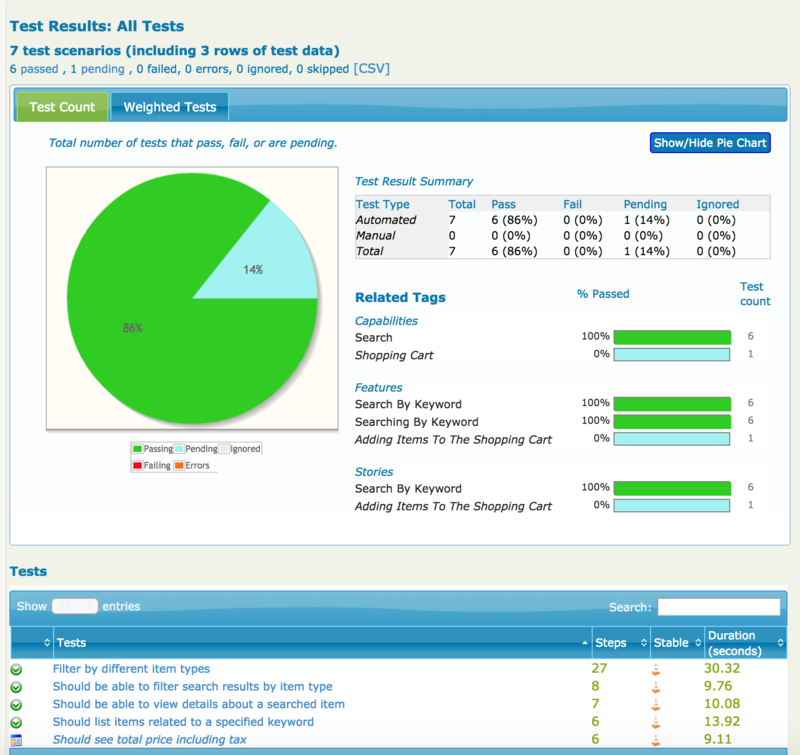 For example, in automated web tests like this one, the step library methods do not call WebDriver directly, but rather they typically interact with Page Objects. Page Objects encapsulate how a test interacts with a particular web page. They hide the WebDriver implementation details about how elements on a page are accessed and manipulated behind more business-friendly methods. Like steps, Page Objects are reusable components that make the tests easier to understand and to maintain. In both cases, we are hiding the WebDriver implementation of how we access the page elements inside the page object methods. This makes the code both easier to read and reduces the places you need to change if a page is modified. Notice how this report faithfully reproduces the example from the conversation with the business, and also gives the option of stepping into the "what", to see how a particular step has been implemented, and (in this case) what the corresponding screen shots look like. Hopefully this will be enough to give you a taste of Serenity and Cucumber-JVM. 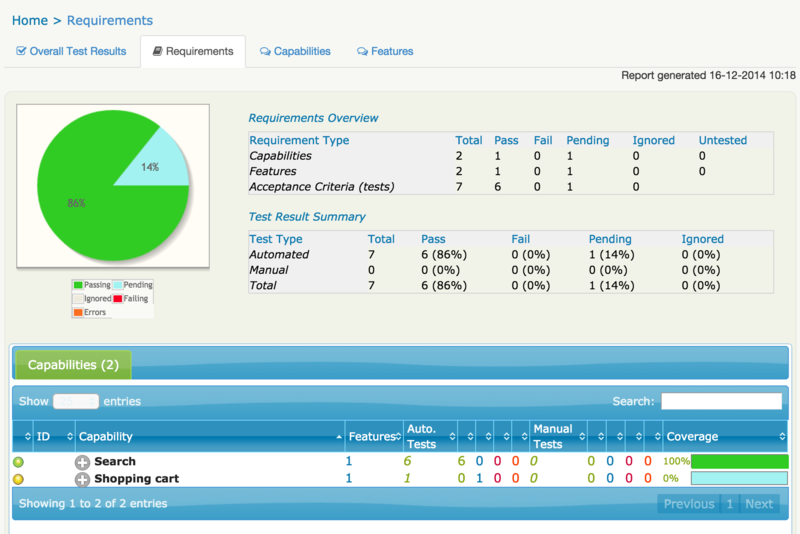 That said, we have barely scratched the surface of what Serenity can do for your automated acceptance tests. You can read more about Serenity, and the principles behind it, by reading the Users Manual, or by reading BDD in Action, which devotes several chapters to these practices. And be sure to check out the online courses at Parleys. You can get the source code for the project discussed in this article on GitHub.